Powers: Star has the strength and endurance of a normal man in peak physical condition. He’s fairly well trained in the martial arts. Weapons: Star has four star shooters that fire razor sharp shurikens, one on each forearm and each leg. Star can attach thin wire for climbing. Special Equipment: Star’s costume has a bulletproof chest and headpiece. He drove a number of special motorcycles, cars and other vehicles. Chris Robinson and his older brother Charles grew up in the city of Chicago and fell in with the wrong crowd as they hit their teens. The two siblings soon found themselves in a gang that was mixed up with the criminal organization known as the Vicious Circle. But while Chris was able to put that behind him his brother, a hapless crack addict, couldn’t free himself from their grasp. Chris couldn’t bear to see hiss his brother destroy his life and left Chicago, joining up with the marines. The singer and actor Peter Klaptin dreamed of being both a superhero and a rock star. After becoming an incredibly successful musician, he decided to focus his energy in the pursuit of his seemingly unattainable goal and designed a costume. The celebrity went out on a single mission but was defeated by the supervillain Basher with ease. Depressed with his failure, Klaptin walked the dangerous streets of downtown Chicago alone and was attacked by a gang of young toughs. His life was saved by the timely arrival of Chris Robinson, using his marine-trained fighting skills to save Klaptin. The singer offered the young man a job as both his bodyguard and the costumed hero of Star. If he could not actually be a hero, he would make the world think he was by disappearing every time Star is in action. This business relationship continued very well for a few years until the Vicious Circle decided to uncover Star’s true identity so that they could prevent him from interfering with their activities. Peter Klaptin was taken to a hidden warehouse and suffered a horrendous beating, the criminals believing he was the vigilante. He is only saved by the real Star, revealed to be the bodyguard of the celebrity, Chris Robinson. The singer fired his employee after he is rescued. Star continued on in his costumed identity but required a new source of income. He joined the Chicago Police Department where he could help himself solve cases by uncovering evidence in his second identity. This double life was uncovered by the Dragon who forced Chris Robinson to quit either the police force or his vigilante status. To keep his new relationship with Alex Wilde going, Chris retired his alter ego. After the couple split up, Chris opted to leave the force and return to his Star persona and join up with the government’s Special Operations Strikeforce, and quickly returned to Chicago for their new branch. Star remained with the team for many months until a mission to rescue She-Dragon from the region dubbed the “Dark-Lands”, a portion of land mass transferred from the alternate Earth, Darkworld. It was here that the second DarkLord began his mysterious agenda and slaughtered both Race and Super-Tough, sending his agent, the second Bludgeon, against the hero Zeek. Bludgeon was defeated in battle and thrown into a mountain which caused rubble to fall onto Star, killing him instantly. The former vigilante is unmasked and Bludgeon learned that he had been partly responsible for his own brother’s death. This action caused Charles Robinson to have his powers removed from him by Negate. In the second reality that Dragon called home, the partnership between Peter Klaptin and Chris Robinson ended a lot sooner than in the previous universe. 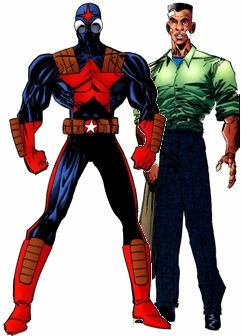 Star II had his race revealed when he was badly injured during the breakout at Stronghold Penitentiary due to Mighty Man II not making his presence known. Peter fired his bodyguard and opted to return to the costume himself. Peter Klaptin’s first outing since his return from retirement proved to be his last as he went to face the possessed Dragon. With no Mace around to save his life, Star was hit with a powerful blow that severed him in half. It was later assumed that this was indeed the true Star and that Chris Robinson was an imposter. After having witnessed the fate of his predecessor, Chris decided not to don the costume again and instead returned to civilian life. After setting up a new life for himself, Chris Robinson got married and started up a new family. He put on some weight and went bald by the time he was eventually tracked down by Alex Wilde. She had sought to be reunited with her former lover but Chris had never even met her in this reality. Any reconciliation was impossible and Alex left him to his new existence. During Mister Glum’s enslavement of humanity, Chris’s wife died from the physical exertion due to a pre-existing heart condition. His children could not keep up with the workload and was killed by his site’s foreman. Chris was left in a very dark place and decided to return to Chicago as a crime fighter. William Jonson had just given up the Star identity and Chris donned the costume and struck up a relationship with Alex Wilde. They eventually decided to move away when the Chicago Police Department was decimated and they sought to avoid becoming the Vicious Circle’s next targets. After many years, Chris is briefly seen along with Alex watching Dragon’s trial on TV.